← Tying Your Credit Card And Web Activity Together? Priceless. The St. Louis Cardinals are officially The Undead of Major League Baseball, having risen from the grave in both the regular season and the postseason. Seriously (so to speak), was that a great World Series or what? Tight (except for the Game 3 blowout), well-played, well-matched, well worth watching. Especially the last two games. The hardworking staff has already weighed in on the transcendent Game 6. Less dramatic – but almost as compelling – was Game 7, in which the Cardinals dismantled a clearly demoralized Texas Rangers squad. ST. LOUIS — It was no surprise that the St. Louis Cardinals were able to withstand the tension and pressure of two successive World Series elimination games. Since Aug. 25, when they were 10 ½ games out of the playoffs, the Cardinals played a month of virtual elimination games just to qualify for the playoffs. The Undead, in other words. 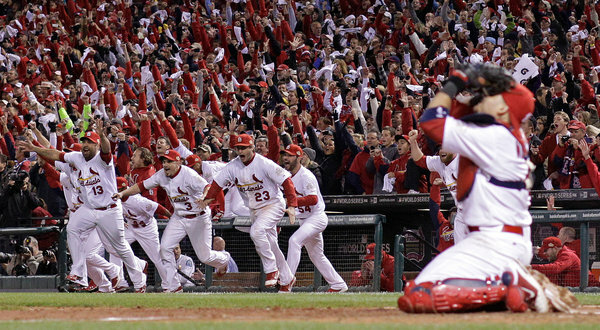 And now the Redbirds have their 11th World Championship. And two of ’em look like V.
Somewhere, the Rally Squirrel is smiling. This entry was posted in Uncategorized and tagged Busch Stadium, New York Times, Rally Squirrel, St. Louis Cardinals, St. Louzarus, Texas Rangers, the Undead of MLB, World's Serious. Bookmark the permalink.